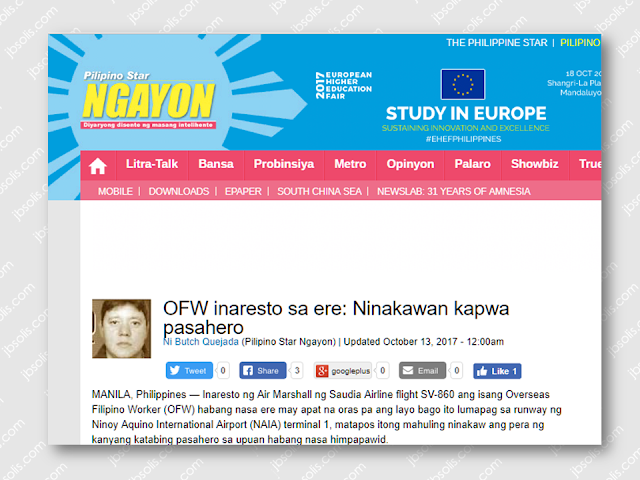 An Overseas Filipino Worker was arrested by the air marshall while onboard Saudi Airline flight SV-860, just hours before their actual landing at the NAIA Terminal 1 due to pilferage. She allegedly stole cash from the passenger sitting next to her. The Filipina known only as Lorena Cancino from Pangasinan. The victim, Rohena Mangomma Talib, 29, and Sitti Shaima Mangomma Talib, 31, complained the incident to the flight crew of the aircraft. She was later arrested by the Airport Police Department. Rohena narrated that the woman sitting next to her was acting strange. The suspect suddenly stood up and rushed to the comfort room. Suspicious of the suspects actions, the victim checked her pocket and found out that her pouch with US$900.00 in it is missing. The victim later went to the comfort room and found her empty pouch at the comfort room’s trash bin. It confirmed her suspicion that the woman has stolen her money. The victim said that her money was later found in one of the aircraft’s seat pocket, under the pillow and the waste cart all covered with tissue paper. Investigation revealed that Cancino has also stolen money from her esponsor in Saudi Arabia, they just sent her home instead of sending her to jail. The suspect is now facing theft charges at the Pasay City Prosecutor’s Office.